Home FEATURE	Get informed, get registered, get voting! 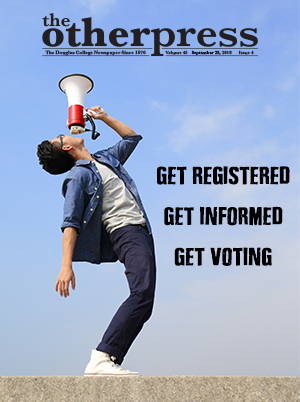 Get informed, get registered, get voting! Are you unhappy about the state of the world, the country, and your local community? Do you look at the US or even as close to home as Ontario and shudder at the idea of all that happening here? Do you wish you could influence local policy changes even a little bit? Well, it sounds like you should register to vote! There are two opportunities to make your voice heard this October: The municipal election on October 20, and the mail-in Referendum on Electoral Reform from October 22 to November 2. Both of these votes will have significant impacts on your local community and the province at large. No shame if you’re lost or a little behind on what’s going on politically; let’s take it back to high school social studies. This October your local government is holding a municipal election. This means your mayor, city councillors, and school board trustees are all running for election or re-election. Candidates will either be running independently or as part of a slate. A slate, it should be noted, is not the same as a political party, however slates can reflect the priorities of provincial or federal parties. A slate is more like an agreement between candidates to share the work in campaigning and to vote together on issues if elected. So, while voting for someone who’s part of a slate is not the same as voting for someone who’s running on behalf of a particular party, it’s worth seeing what their slate formally supports and who they’re running with. The Electoral Referendum is another matter entirely. The Other Press has already covered what the referendum will entail, but to quickly recap, the province is trying to fix our current voting system. Right now, we operate under a “first-past-the-post” (FPTP) voting system, which has been criticized for not truly representing the wishes of voters. Our choices on the referendum will be to change from FPTP to a dual member proportional system, mixed member proportional system, or rural-urban proportional representation system. That doesn’t sound very exciting. Why should I care? I’ll admit, as someone who’s actually sat down and listened to several full city council meetings, it’s not exactly prime entertainment. However, your local city council and school board are responsible for decisions that can impact some pretty significant parts of your day-to-day life! Do you take transit and wish you had a better bus system in your town—or even better, a light rail system of some kind? City council decides a lot of that. Do you care about your local parks? That’s usually covered by municipal government as well. Do you think rent in your area is unaffordable? Congratulations on living in the Lower Mainland, but yes, municipal government has a large role to play in affordable housing decisions. The province can try to put forward initiatives to help ease the financial burden on renters and home owners, but without the support of local government, we’re not going to see much in the way of substantial change on that front. Voting for the school board is important too! It may not affect you directly at the moment, but for the sake of those still in public school and for the sake of your siblings, relatives, or (potential future) offspring, it’s worth keeping an eye on where the local school budget is going. As for the referendum, well, if you feel like your vote doesn’t matter much right now because of the current system, your vote can have a hand in changing it! The good news is you have plenty of time to get informed before the municipal election and the referendum! The best place to start learning about local candidates is in your local newspaper. Now that nominations are over, and the list of candidates has been finalized, you’d best believe you’re going to start hearing a lot about your local nominees. Local newspapers will also probably announce the times and dates of upcoming debates, which I highly recommend attending. This is your chance to ask candidates direct questions about their policies and let them know what your priorities as a voter are. Candidates will likely start door-knocking over the next month leading up to the election. I know it’s going to be tempting to turn off all the lights and pretend you aren’t home, but this is a unique opportunity to talk to a potential community representative one-on-one. At the very least, don’t immediately trash the flyer they’re no doubt going to leave in your mailbox or on your doorstep. Facebook is also a good place to learn more about your local candidates. As people become more social media literate, I’m finding that a lot of local government officials are starting to make good use of Facebook pages and groups to organize and promote their platform. If you find a candidate you’re personally passionate about, let people know! Oftentimes people will just vote for names they recognize if they’re not super informed on the issues. Make sure to support your ideal candidate by making their name recognizable to people within your social group. As for the referendum, there are plenty of resources online detailing the differences between the potential voting systems. Assess your own priorities as a voter and do a little research to see which system lines up with them. Talk to your friends and family about it—hell, you can even ask one of your Douglas profs if you’re confused. I find one of the best ways to make an informed decision is to not only read up on the technical aspects of the choices provided, but to listen to the opinions of people I trust on the matter as well. It isn’t! I honestly updated my voter registration information before writing this article and it took me all of five minutes, if that. You can do it online at elections.bc.ca/ovr and all you need to have on hand is a personal identification number of some kind (driver’s license, Social Insurance Number, Personal Health Number, et cetera). Elections BC has, according to the website, already passed along your registration information to local governments, so you’ll want to check with your local government election office to make sure you’re registered to vote in the municipal election. That part I’ll admit is a bit of a pain, but looking up your local government office is super easy—you can find the contact information for yours at www.civicinfo.bc.ca either in the directory or under “municipalities”. Change starts small and it starts at home. If we want a better future for our country, we have to start treating every election and every vote like it matters—because it does! Poor voter turnout has spelled disaster for the priorities of people in our age demographic. A democracy functions best with an informed and engaged population. So, get informed, get registered, and get voting! Everything is terrible—so what now?